Despite a modest perception of their own financial knowledge, non-Millionaires are increasingly relying on their own investment acumen to make financial decisions, according to a new Spectrem Group wealth level study of households with a net worth of at least $100,000 (not including primary residence). Three-in-ten report using a financial advisor for specific purposes, such as asset allocation, saving for college or retirement planning. This is down from 33 percent last year. This spike in self-directed non-Millionaires coincides with an increase in enthusiasm for investing. 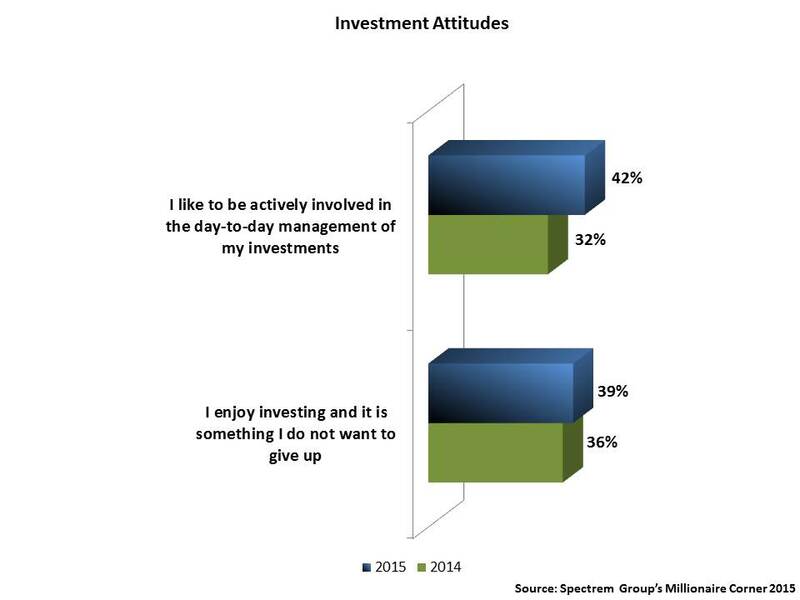 Roughly four-in-ten said they enjoy investing and it is not something they want to give up, up from 36 percent in 2014. Forty-two percent like to be actively involved in the day-to-day management of their investments, up significantly from 32 percent last year. They might want to consider an advisor's counsel, though. More than half (55 percent) describe themselves as only “fairly knowledgeable” with a great deal to learn. There are more non-Millionaires (26 percent) who consider themelves “not very knowledgeable” than there are those who perceive themselves to be “very knowledgeable” about financial products and investments (15 percent). Among surveyed non-Millionaires, spouses are more likely than financial advisors to be considered helpful in making financial decisions (68 on a scale of 0 to 100 compared with just under 63). Across age levels, the highest percentage of non-Millionaires who profess to enjoy investing are Millennials under the age of 35 (49 percent), followed by Gen Xers ages 36-44 (45 percent). But seniors over the age of 65 are the most likely to be actively involved in the day to day management of their investments (45 percent vs. 33 percent of Millennials). Interestingly, Millennials are the most likely to say they are “not very knowledgeable about financial products and investments (38 percent).